Here's a Christmas card I made for a friend showcasing one of my favorite stamps, Paper Pretties, Sophie (Trim the Tree). Isn't she cute? No doubt, you have seen this stamp around the Web on numerous blogs. If you haven't heard about the Paper Pretties Stamp of the Month Club, you can visit the website for information on how you can join. The patterned paper is K&Company and Copic markers were used to color Sophie and her dress. To color the ornament, sash, and hair ribbon, I used glitter pens. 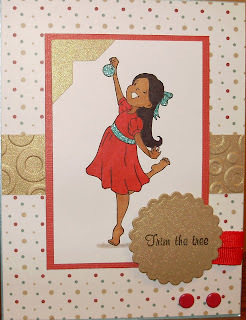 For the gold strip, I embossed it with a Cuttlebug folder, stamped the sentiment on cardstock, and punched it out with the scalloped, circle Nestabilities. The photo corner was created using a SU punch. This card creation was super easy!